If I Reset My iPhone What Will I Lose? When you have issues with your iPhone; let’s say you can’t unlock your device because you forgot or the screenlock was disabled when bought it and you had to reset, a question always comes to mind before you do that: “If I reset my iPhone what will I lose?” or “If I reset my iPhone, will I lose everything?” One thing guaranteed is that your iPhone returns to optimal function and becomes much better than it was before the reset. Part 1: If I Reset My iPhone What Will I Lose? Part 1. If I Reset My iPhone What Will I Lose? After encountering a major setback in your device and the only available solution is to reset, then you need to know that you will lose some data and files (if not all). However, different reset leads to different results. If you reset all settings, it will only be temporary and not all files or data will be lost. In fact, some junk and temp files i.e. it keeps your apps and data but will reset all personal preferences and network settings. If you erase all content and settings, it will delete all data on your iPhone, including songs, videos, images, etc. It is somewhat similar restoring back to factory settings. One of the available methods Apple has put in place for iPhone users to reset their phones. It involves making a connection with a PC and logging into iCloud or launching iTunes respectively. This method is however complicated but resets through iTunes and iCloud will make you lose all your files and data; more like restoring back to factory settings. If you need to get back your data you may need to get help from some professional recovery tool. When you reset iPhone with any of the method listed above, no doubt, some important files could be deleted or lost and you would want to restore them. 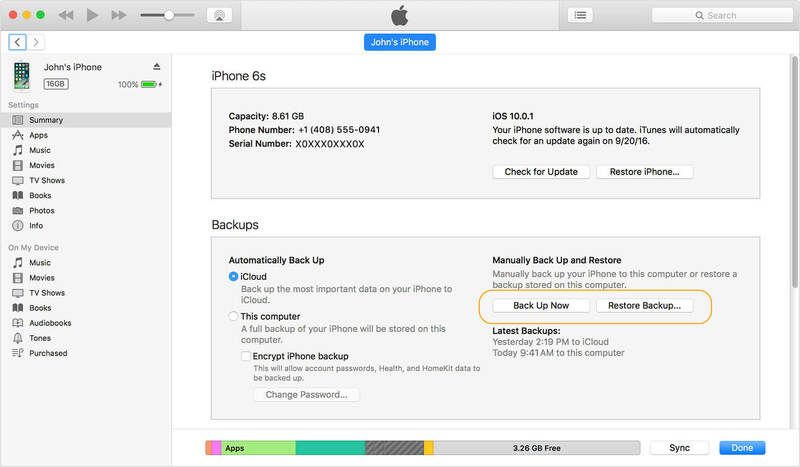 In order to do this, you can restore iPhone from an iTunes backup if you have backed up before. Apple set up this method so the maximal use of iTunes can be put into action and one can be able to backup devices in case of future problems. Step 1: Connect your iPhone to a PC. Step 2: Make a quick launch of iTunes and go to File menu, select “Devices”. Step 3: Choose “Restore Backup”. Step 4: Pick a recent backup on the basis of size and date, and click on “Restore”. After all these steps, you now have your iPhone restored via iTunes, and this is also very useful also after reset. If you just reset your iPhone, you will lose something; if you keep all your personal data on your iPhone without a complete reset, then you may lose your privacy. You need to stop asking yourself the question of: “If I reset my iPhone, will I lose everything?” and start considering how to make your device safer next time after a reset. However, even with the three methods above, normal reset is not enough. The use of iMyFone Umate Pro for Windows or iMyFone Umate Pro for Mac is advisable for maximum efficiency because it ensures complete reset alongside protection of privacy. To better manage your personal privacy on your iPhone, you need to clean out that private information permanently. Here’s what iMyFone Umate Pro can help. It can help you perform a complete reset on iPhone to make your privacy safer. Perform a complete reset by erasing all data with 0% recovery rate. Secure your private data including messages, call logs, browsing history, photos, videos, etc. Wipe out messages and attachments of third party Apps permanently. Step 1: Download iMyFone Umate Pro and connect your iPhone to the computer. Step 2: Select the “Erase All Data” tab and click "Erase" and then it will start to scan the device. Step 3: Confirm your choice to delete by typing “delete” into the box. Step 4: After you type “delete” into the box, tap on the Erase Now to make sure a complete reset on your iPhone. Private Data Reset: a feature that removes and erases all private and sensitive data from your iPhone without being recoverable. Erase Deleted Files: Most files that we deleted on an iPhone aren’t totally deleted and with the aid of iMyFone Umate Pro, they can be deleted without being recoverable. Erase Private Fragment: third-party application on your iPhone doesn’t completely delete private fragments of sensitive information from messages, calls, etc., iMyFone Umate Pro scans your iPhone and erases these private fragments. It is good to reset your iPhone and save yourself a whole lot of trouble with any of the three methods. However, iMyFone Umate Pro has been designed in such a way that your phone is kept safe and secure as well as ensuring your phone is reset to give you better satisfaction. Hope you get the answer of the question: “If I reset my iPhone, will I lose everything” after reading this article.